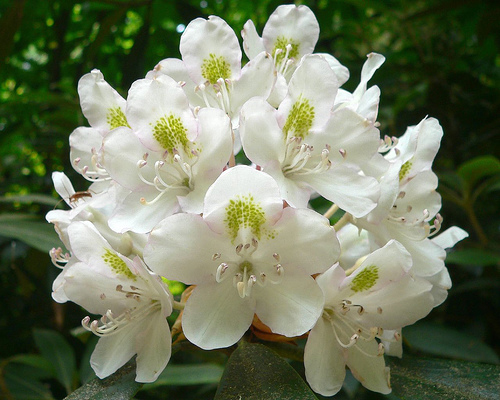 Rhododendron; photo by Arx Fortis on Wikipedia (use permitted with attribution / share alike). Rhododendron (Rhododendron maximum) was designated the official state flower of West Virginia in 1903. The rhododendron beat honeysuckle and wild rose by more than 15,000 votes in a poll of public schoolchildren from across the state. All State Flowers. The rhododendron is actually a flowering shrub with purple, pink and white blooms in late spring. Common names for Rhododendron maximum include American rhododendron, great laurel, and great rhododendron (or big rhododendron). This species of rhododendron is native to eastern North America (the state of Washington recognizes another species, coast rhododendron, as an official state symbol.